Kyou is dressed in her school gym uniform, complete with bloomers and thigh highs that she always wears. She is posed in a kneeling position looking sweetly innocent as she stares up at you. You don’t plan on taking advantage of her, right? ^^; This figure is actually based on a scene from episode seventeen of the anime series. Have you seen the series? Well, either way here’s a video of the specific scene! As usual, Kyou wears a white ribbon bow on the left. Ryou, her twin sister, wears one on the right. Kyou does not disappoint her fans and dressed in a proper gym uniform: bloomers! Really love this shot. Kyou looks thoughtfully into the distance. Zettai ryouiki is in full effect! Experimented with a bit of overexposure. Any good? And some nice, warm sunset shots to finish things off. I had to wait a few more hours after my initial photos to capture these just as the sun set and cast this warm, soft light which only lasts for a few minutes. 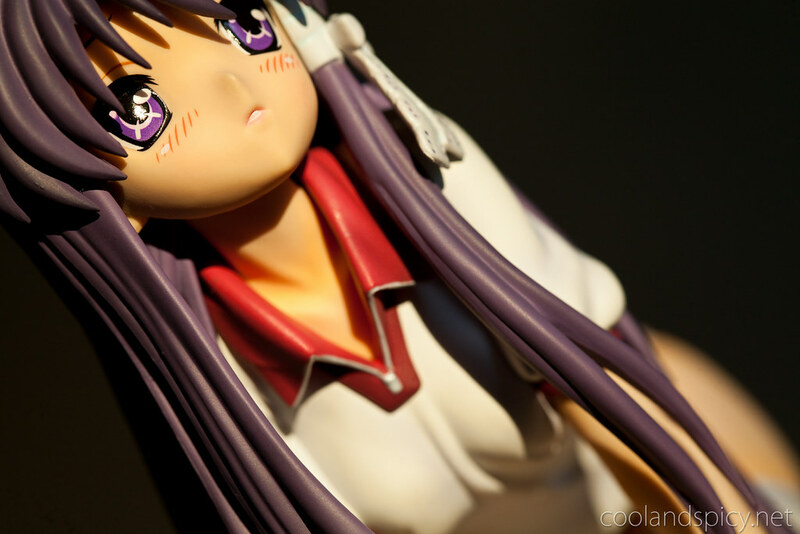 And so, I have yet another Kotobukiya figure review. I think by now we know that Kotobukiya figures aren’t always the highest quality. 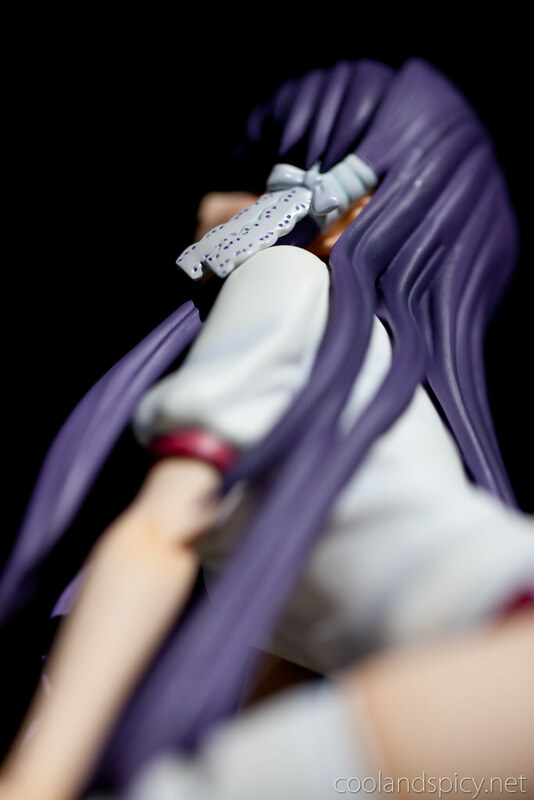 However, I have to say that this Kotobukiya figure is actually pretty respectable quality-wise. Kyou’s gym uniform is nicely detailed with folds in the cloth and shadow shading. Her gym shorts (bloomers! :3) aren’t just a flat red, the the color varies from light to darker to simulate stretching fabric and darker crevices. heehee ^^; Her fingernails are painted pink and cheeks are blushing brightly. Really, this is an attractive figure. Kotobukiya has done a fine job on this. Sure, it’s not perfect. Some of the seams could have been better (particularly on her bloomers), and the strands of hair could have been finer and more detailed, but I still love this figure. Kyou just looks great! I actually used to own most of the Clannad Kotobukiya figures, they were really cheap (at the time) and my collection was craving more girls on the shelves. As time went on though I began to regret buying figures of characters I had no major connection to. Luckily many of the figure collectors out there had a huge connection with these characters and I was able to sell them pretty easily at a small profit. 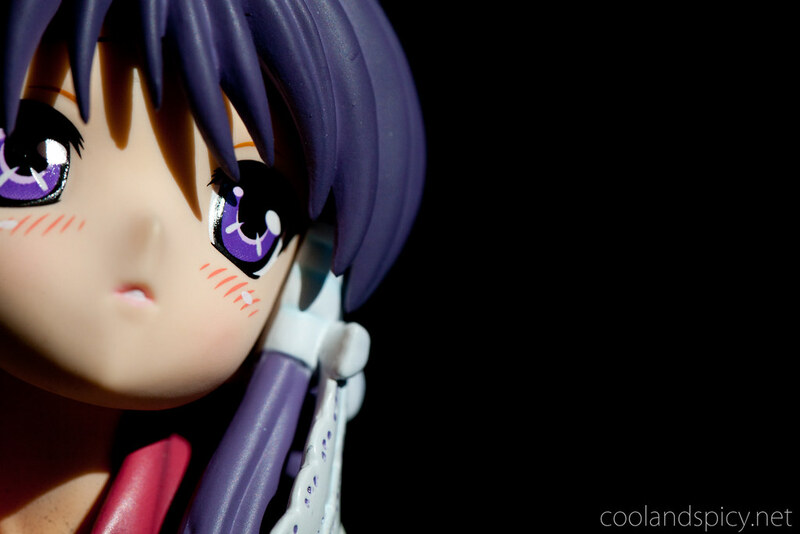 I do plan on trying out Clannad someday, but I don’t think I’ll regret selling those figures. 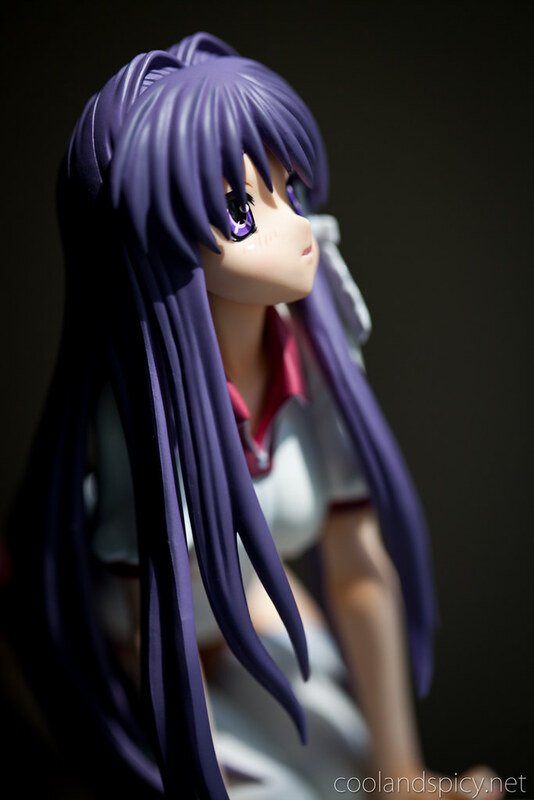 Although I should add that this Kotobukiya Clannad figure is significantly better quality than the ones I sold. The difference is pretty noticeable. Oh the pretty Kyou, never saw such a nice figure with bloomers before and these high highs, oh man ;D I also like the realistic looking base. “Experimented with a bit of overexposure. Any good?” Yup, nice shot ^^ as well as the one with the sunset light kyou -breaking point-15 and also kyou -breaking point-3 from above. Bloomers and thigh highs are Kyou’s trademark nose-bleed-inducing outfit of choice. She will get you! I like the sunset pics as it does ad a nice warmth to the shot. This might seem like a completely random and irrelevant comment, but i love the detail theyve put into the stand, so many times they get overlooked! Her face and her posing are great! Zettai ryouiki! 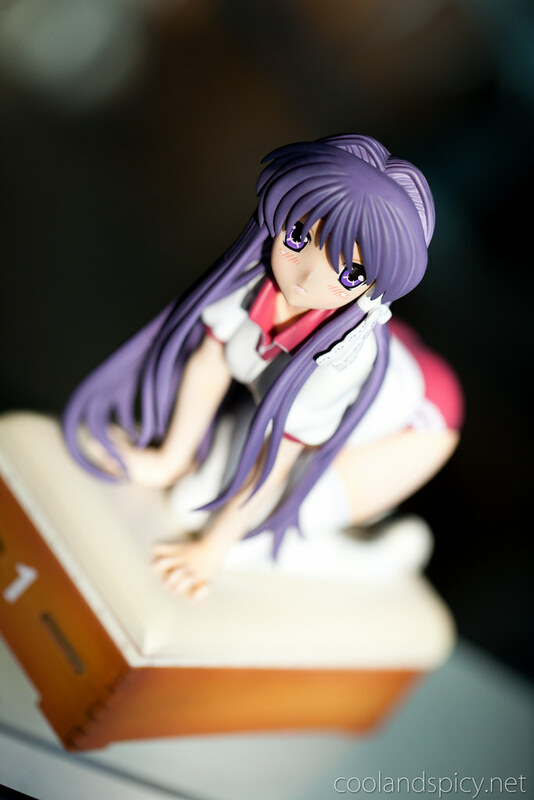 Even though I haven’t seen Clannad, and Kyou’s outfit is pretty simple, I like this fig. I’ve always been biased when it comes to zettai ryouiki. Lol. Great job on the photos!